Kingaroy is an agricultural town and locality in the South Burnett Region, Queensland, Australia. It is approximately 210 kilometres (130 mi) or about 2½ hours drive north-west of the state capital Brisbane. The town is situated on the junction of the D’Aguilar and the Bunya Highways. It is known as the “Peanut Capital of Australia” because Australia’s largest peanut processing plant is located in the town and peanut silos dominate the skyline. Kingaroy is also well known as the home town of former Premier of Queensland, Sir Joh Bjelke-Petersen. Kingaroy itself is the largest town in the South Burnett and the region’s commercial centre, offering all the services, shopping facilities and many of the industries generally expected in much larger centres. The town has its own hotels, motels, caravan parks, bed and breakfasts and cabins; and a range of restaurants, fast food outlets and petrol stations (including 24-hour petrol stations). Unlike many towns of its size, Kingaroy has its own shopping mall that includes Woolworths, Big W, and other retailers. Kingaroy also has an aerodrome a few kilometres from the centre of town and is regularly served by major bus lines. Kingaroy has the most cosmopolitan feel of any South Burnett township but it’s still a relaxed, friendly and informal country town at heart. It has the typical low-humidity climate of all South Burnett townships and is surrounded by extensive (and very picturesque) farmlands interspersed with low rolling hills. The Booie Range, home to several wineries and cellar doors, lies immediately north-east of the town and the Bunya Mountains about 55 kilometres (34 mi) to the south-west. The township is situated in the middle of some spectacular scenery, and is popular for bushwalking. Toowoomba is located 125 km west of Brisbane via the Warrego Highway. It sits on the edge of a plateau which is 600-800 metres above sea level. Today Toowoomba is the largest inland settlement in Queensland and one of the largest inland cities in Australia. It has been described as ‘Regional Capital of the Darling Downs’ and ‘The Garden City’. Both descriptions are accurate. It is a city to be enjoyed for its history, its elegant buildings, its superb parks (particularly in spring) and the very impressive – and huge – Cobb & Co Museum. 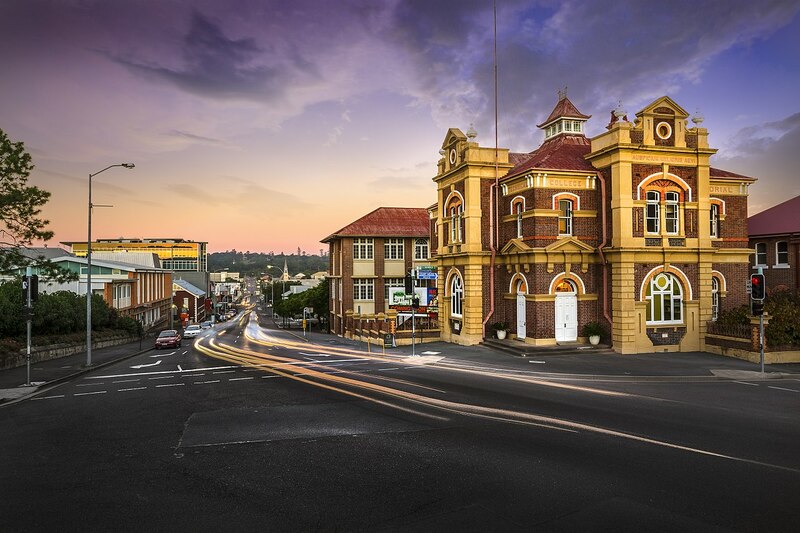 Toowoomba’s most impressive tourist attraction is the Cobb + Co Museum at 27 Lindsay Street which is part of the Queensland Museum Network. It is a huge museum which includes extensive ethnographic and historical collections as well as a constant program of travelling exhibitions. The Ethnographic Collection is a combination of Aboriginal and Torres Strait Islander cultures which includes musical instruments, archaeological remains, weapons, tools, personal adornments and utensils. Located to the south of the Warrego Highway at the top of the escarpment Picnic Point Lookout offers superb, panoramic views across the the Lockyer Valley and Tabletop Mountain. The circuit around Picnic Point is a total of 5310 metres. There is a good map on a large board near the Car Park. If possible it is always best to visit Toowoomba in the spring or autumn when the city’s gardens and parks are at their best. Toowoomba has over 1,000 hectares of parkland including the natural bushland escarpment Picnic Point Park, Redwood Park and Jubilee Park and the centrally located Queens Park. Affectionately known as the ‘oasis of the outback’, Mount Isa is a gleaming mirage on the horizon for travellers from all directions. Nestled among the ochre-red Selwyn Ranges, on the banks of the Leichhardt River, Mount Isa is a bustling melting pot of culture and industry and also home to the world’s third largest rodeo. It’s grown from strength to strength over the years but the harsh picturesque landscape has barely changed, becoming one of the main draw-cards for visitors each year. Mount Isa has ample places to fish, camp or relax and enjoy an outback sunset. The rugged terrain is a four-wheel-driver’s haven, and visitors can explore the region just as the pioneers of the region did many years ago. The twin jewels in Mount Isa’s crown are the spectacular Lawn Hill Gorge in Boodjamulla National Park and its neighbour, the world heritage listed Riversleigh Fossil Fields. A must see is the Outback at Isa complex, incorporating the award winning Riversleigh Fossil Centre, Hard Times Mine, Sir James Foots Building, Outback Park and Visitor Information Centre. The Hard Times Mine is a working replica mine designed and operated by actual miners where you can gain an insight into the industry integral to Mount Isa’s economy. If you’re in town in August, try and time your visit with the Mount Isa Rodeo, one of the largest in the world. Mount Isa’s existence and its main financial base is the huge Mount Isa Mine, the world’s largest single producer of copper, silver, lead and zinc. In 1923, John Campbell Miles found a silver-lead ore outcrop. This rich deposit is still producing high volumes of ore and is classed as one of the world’s great mines. Other attractions are the School of the Air, which provides an education to students on remote properties as far as 1000 kilometres away via satellite internet. Mount Isa is also home to one of Queensland’s largest Royal Flying Doctors bases, the National Trust Tent House, a WW2 Underground Hospital and the Beth Anderson Museum. 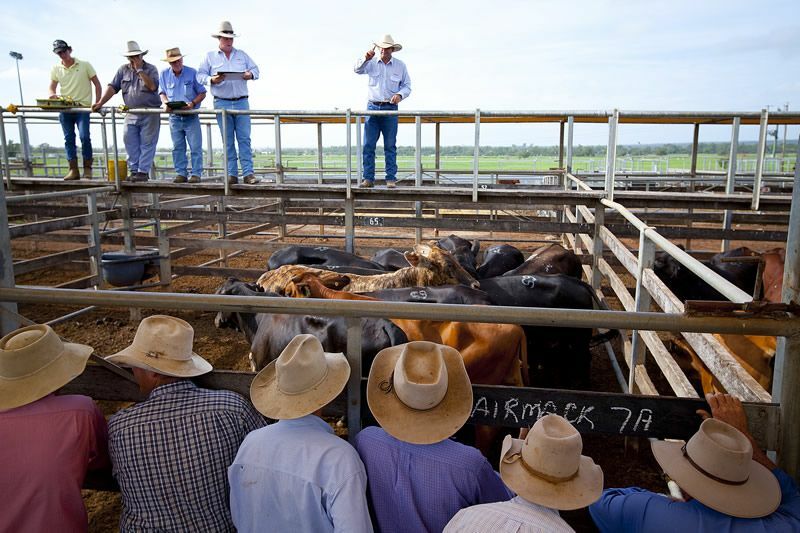 Only 350 kilometres north-west of Toowoomba, Roma Outback Queensland is home to the southern hemisphere’s largest sale yards. Visitors can get a feel for the outback by perching on a fence or taking a coveted possie on the viewing platform to watch the action at Roma Saleyards. Be sure to time your visit for a Tuesday or Thursday and you can witness the sale of up to 12,000 head of cattle in a single day. To get a real feel for the town itself, take a walk along the heritage-listed Heroes’ Avenue, which is planted with more than 100 bottle trees. Each tree is a memorial to a local soldier who lost their life in WW1. For a dose of history, head to the Mount Abundance Homestead, built in 1860, which is the site of the region’s first settlement. The homestead has important links to early explorers Sir Thomas Mitchell and Ludwig Leichhardt. Don’t miss the Big Rig Oil and Gas Interpretative Centre and Night Show for an interactive insight into the hardships and heroic stories of oil drilling and exploration. Visit the ‘Oil Patch’ to get up close to impressive rigs and one of the first diesel powered rigs ever used in Australia. There’s a varied calendar of events from Picnic Races, the Roma Cup and Easter in the Country to the multicultural Santos Food and Fire Festival and all the fun of the Roma Show. Sitting gracefully on the banks of the Condamine River, historic Warwick – known for its roses and rodeo – features some of the state’s finest original sandstone buildings. From here it’s an easy drive to explore the friendly villages and small towns of the Southern Downs. Settled over 150 years ago, the town is rich in “Heritage and Historic Building Trails” featuring a number of well-preserved churches, cottages, railway stations, schools and monuments – each with its own story of old. One of the most interesting stories is that of Thomas Byrnes whose imposing statue stands in the main street – the talented son of poor Irish immigrants, he rose to be Queensland Premier in 1898 and after just five months in office, tragically died of pneumonia. Two must-see attractions along the trail are the Warwick and District Historical Museum – the best place in town to discover life as it was from the 1890s to the 1950s, and Abbey of the Roses – formerly Our Lady of Assumption Convent, built for the Sisters of Mercy. For almost 100 years it formed the “heart” of the extensive Catholic community in Warwick; in its new life it is a popular boutique guest house and function centre. In testament to its reputation as the “Rose City”, rose plots are prolifically planted throughout Warwick’s Central Business District and can be seen at the Visitor Information Centre, the Warwick Art Gallery, the Warwick and District Historical Society Museum and in various plots on the northern approach to the city. Known as the “Horsepower Capital of Australia”, Warwick is home to the Warwick Rodeo – Australia’s most famous, held each October, as well as Morgan Park Raceway – host to world-class motor sport events. From a dirt track in 1965, Morgan Park Raceway has evolved to become one of Queensland’s premier motorsport venues incorporating a drag-racing track that attracts Australia’s top competitors. Morgan Park’s first-rate equestrian facilities played host to the Polocrosse World Cup in 2003, 2007 and will again in 2019. Ipswich is centrally located in the booming south east Queensland region of Australia. To the east is the capital city Brisbane, and to the west are the rural and agricultural areas of the Brisbane, Lockyer and Fassifern Valleys. The city is ideally positioned on the national road network – 40 minutes drive from Brisbane, an hours drive from the Gold Coast and 60 minutes drive from domestic and international air and sea ports. Ipswich comprises an area of 1090 square kms and has a population of 200,000 people. Ipswich enjoys a subtropical climate and is a safe, friendly and multicultural city. Residents come from 115 different ethnic backgrounds, speaking 84 languages. As Queensland’s oldest provincial city, Ipswich has a rich history. It is renowned for its architectural, natural and cultural heritage. Ipswich proudly preserves and still operates from many of its historical buildings and homes, with more than 6000 heritage-listed sites. Ipswich also has a range of charming townships within the western rural areas of the city, each with its own legitimate claims of historical significance. Ipswich offers all the modern facilities and attractions of a progressive city, with attractions and highlights including steam trains, over 550 parks, including the heritage-rich Queens Park and modern Orion Lagoon, as well as eateries, cafes, restaurants, cinemas and shopping centres. Art lovers will delight in the Ipswich Art Gallery and the Workshops Rail Museum is a rail enthusiast’s dream. If you fancy a bird’s-eye view of the Ipswich region, enjoy the best vantage point from above with Floating Images Hot Air Balloon Flights or a Pterodactyl Helicopters tour. Ipswich hosts regular national and local festivals and events such as the Queensland Open Golf Championships, the annual major horse race the Ipswich Cup, drag-racing’s finest at the Winternationals held at Willowbank Raceway, Queensland 400 V8 Supercars at the Queensland Raceway, the Ipswich Festival and the Ipswich Show. Gympie, a rural city in the Mary River Valley, is 150 km north of central Brisbane. A gold rush from the late 1860s brought rapid growth and grand buildings in what soon proved to be a flood-prone main street. Fine mansions sprouted on the flood-free hill tops, but the lower part of the main street is still inundated from time to time. Gympie was the administrative seat of the Cooloola Shire and continues that role with the Gympie Regional Council. The Gympie Township was haphazardly laid out, some streets following the random placement of the first boom-time buildings. ‘Suburbs’ came about as gold was found at One Mile and Monkland. Access overland from Brisbane was initially difficult, the preferred method being by steamer from Brisbane to Tewantin and then by coach. Easier access came with a railway from Maryborough in 1881, and a rail connection to Brisbane followed ten years later. By the early 1880s Gympie borough (established 1880) had a population of about 4500 people. It boasted two newspapers, a hospital, a school of arts, a miners’ institute at One Mile, a handsome Church of England as well as Catholic, Presbyterian, Wesleyan, Congregational and Primitive Methodist churches, seven schools (including five State) and a gas company. Gympie Court House is a heritage-listed courthouse at Channon Street, Gympie, Queensland, Australia. It was designed by John Smith Murdoch and built from 1900 to 1902. It was added to the Queensland Heritage Register on 21 October 1992. It is the third court house constructed in Gympie and is located in a prominent location on a ridge at the corner of Channon and King Streets. It was constructed between 1900 and 1902 and is a brick structure with a clock tower on the southern side of the front entrance.